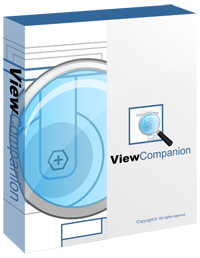 ViewCompanion can batch convert all supported file formats, which includes PDF, PLT, CGM, DWF, TIFF, CALS, JPEG, PNG and more. 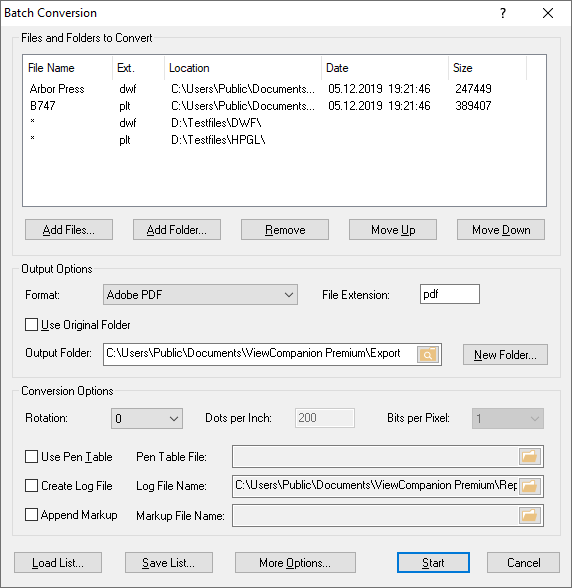 The batch convert feature in ViewCompanion is easy to use, just open the dialog and start adding files and folders. All sub folders of an added folder will be processed, and the tree structure will be maintained in the output folder. By default all supported files in the folders will be processed, but you can configure ViewCompanion to process a specific file extension by using a mask, for example "*.plt". PLT, DXF, PNG and more. In this example we've added two files and two folders to our batch. For the first folder we will process only files that have the DWF extension, and for the second folder we've selected PLT files only. Output format is set to PDF. If you want to convert to any of the raster formats, for example TIFF, you must set Bits per Pixel option to match the number of colors you want, if you want to convert to black and white raster only, you should set this to 1. For color raster the best result will be obtained by using 24 bits per pixel (True Color). The Dots per Inch setting controls the resolution of the raster, a higher value gives better quality but the file size will increase as well. 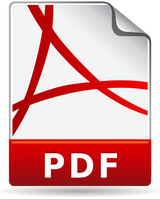 PDF writer format selection: 1.6 or PDF/A. TIFF compression method: CCITT Group 4, Packbits, LZW or no compression. All of them include batch conversion but the number of file format each of them support is different. You may look at the ViewCompanion comparison chart for a list of the major differences between the editions.